Purchase online in India 4"x 4" Double Sided Copper Clad PCB at low price from DNA Technology, Nashik. This is a 4 inch x 4 inch (10cm X 10cm) Double Sided Copper Clad PCB. Also called as Blank PCB. This PCB is perfect for hobbyist who want to try out making double sided PCB's at home. Size / Dimension: 4" x 4"
Material: Copper Clad Both Side. 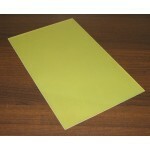 Copper Clad 4"x 6" Paper PhenolicThis is a 4 inch x 6 inch single sided Paper Phenolic bare copper c..